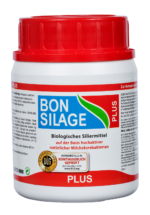 The BONSILAGE range includes the right silage additive for any requirements to ensure optimal ensiling outcomes. Click here for an overview of this product range. For further information please visit the individual product pages. 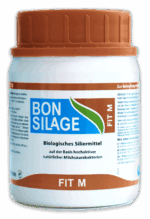 The Product Finder gives an initial overview of which BONSILAGE product may be right for you. The BONSILAGE BASIC products optimise the fermentation process and improve silage stability. 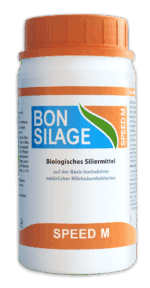 Special bacteria strain combination for lucerne, clover grass and other leguminous silages. 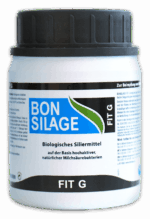 Five hetero- and homofermentative lactic acid bacteria strains for aerobically stable grass, clover grass, lucerne and forage rye silages and whole-cropsilages with > 30% DM. 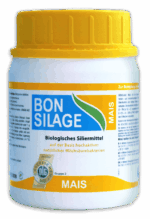 For maize silage and WCS. 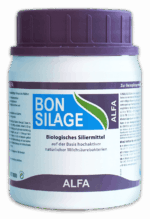 Alters the fermentation pattern, protects against yeasts and mould. Prevents reheating. For maize grain meal and CCM. 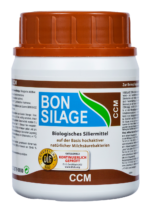 Protects against the uncontrolled proliferation of yeasts by forming acetic acid. 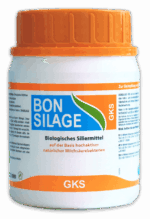 For the treatment of whole maize grain silages in gas-tight tower silos. 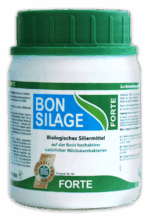 Protects against yeasts and mould if the storage period is sufficient.